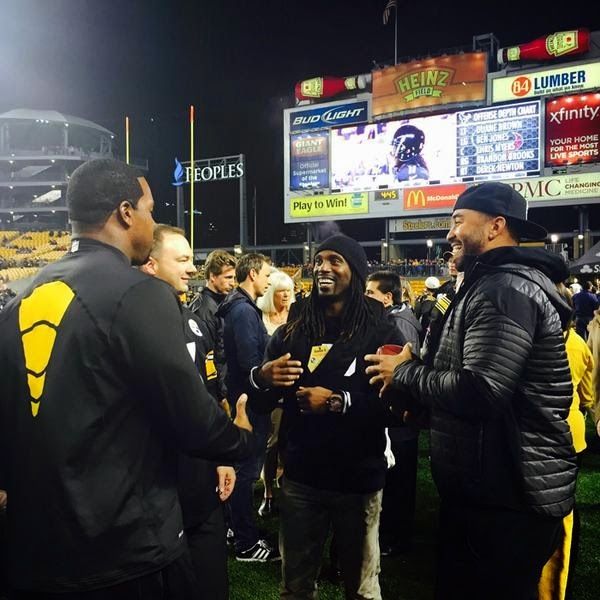 Andrew McCutchen, Joey Porter and Matt Kemp were at Heinz Field last night to enojoy some pregame banter at last night's Monday Night Football game in Pittsburgh, pic above via @steelers on twitter. The Steelers defeated the Texans, 30 - 23, largely due to a huge offensive explosion in the second quarter of the game; they scored 24 of their 30 points then. Continuity, baby! Via Mark Saxon at ESPN, "Source: Scouts returning for 2015." Via Jon Weisman at Dodger Insider, "Davises, Strawberry to enter L.A. City Section Hall of Fame." 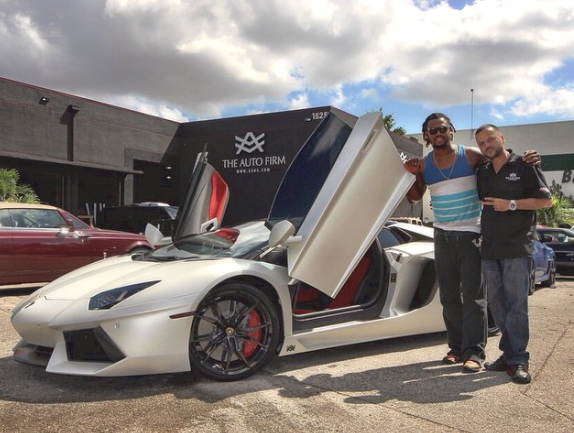 Via TMZ, "Dodgers Star Hanley Ramirez My Lambo Spits FIRE!" Check out the TMZ article to see it breath fire. TMZ Sports has learned ... Hanley dropped around $550k for a white 2014 Lamborghini Aventador -- but wanted to make it stand out ... so he went to The Auto Firm in Miami and upgraded the exhaust to one that spits flames. Dodger collector Night Owl Cards writes a wonderful piece entitled, "That Year Was Next Year." My attachment to the Kansas City Royals doesn't come from living in the Midwest or because their colors are similar to the Dodgers or because I want the Giants to lose when the World Series starts. It's not even because I remember the Royals' victory in the '85 Series. No, my attachment began in 1976 when the Royals took on the Yankees and were demoralized by Chris Chambliss' home run off of Mark Littell. Via Scott Andes at Lasorda Lair, "Schebler, Sweeney Heating Up, Seager Off to Slow Start in Arizona Fall League." The Awards for Clayton Kershaw are only beginning to start. 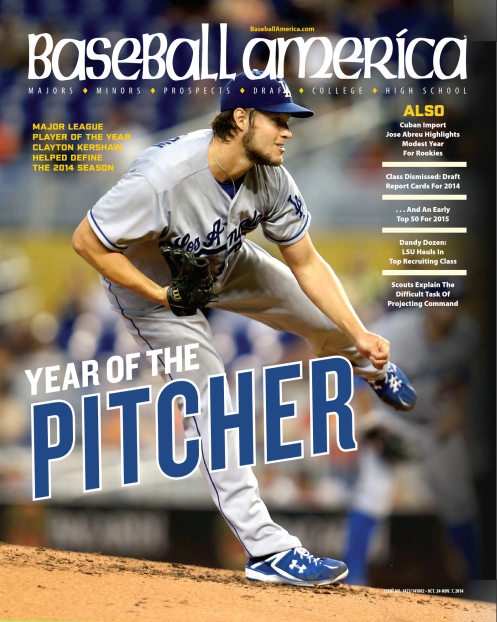 Via Bill Shaikin at Baseball America he was named the PLayer of the Year: "Major League Player Of The Year: Baseball’s Best Pitcher Keeps Looking Ahead." BTW, for the fourth season in a row Atlanta Braves closer Craig Kimbrel and newcomer Yankees reliever Dellin Betances were named the 2014 Goose Gosage Award winners yesterday by the Baseball Bloggers Alliance. The Goose Gosage Award recognizes the best reliever in each league. I had picked Kimbrel on my National League ballot. Furthermore, late last week, White Sox Jose Abreau and NY Met Jacob deGrom were named the Willie Mays Award winners for their respective league. This award recognizes this past season rookie of the year. Go here to see who were my picks for the BBA (Baseball Bloggers Alliance) Post Season Awards.